Brunch and lunch have three important differences. The first is the egg - the humble googie instantly closes the gap between breakfast and lunch, making the simplest dish brunch-worthy with its sunny yolk and creamy richness. 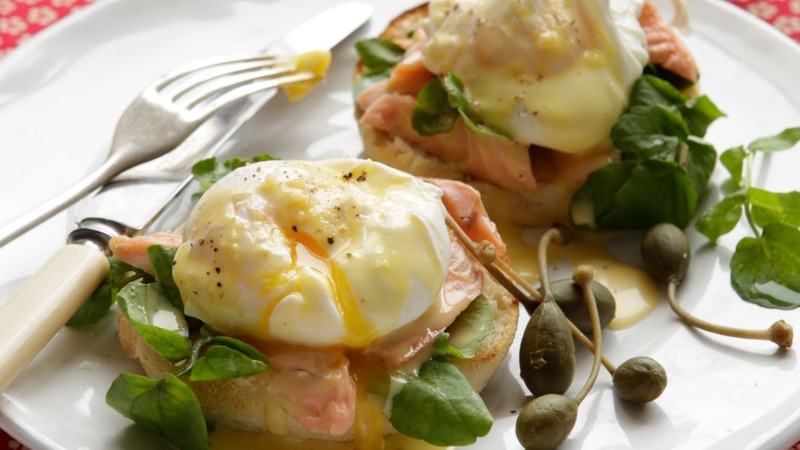 Hollandaise sauce is a simple emulsion of butter, egg yolks and lemon juice. It is made easily in a blender and can be kept warm in a bowl sitting over warm water, the surface covered with cling film to stop a skin forming. Skin trout and break the fish into bite-sized pieces, discarding skin and bones. To make hollandaise, melt butter gently in a small pan; scoop off and discard the frothy residue that comes to the surface. Whizz yolks, lemon juice, salt and pepper in a blender until pale and smooth. While still blending, slowly pour in hot melted butter. Transfer to a heatproof bowl set over a pan of hot water, to keep warm. To poach eggs, heat a pan of water to a bare simmer. Add vinegar, then place two stainless steel cook's rings in the water. Crack an egg into each ring and poach for three to three-and-a-half minutes, basting once or twice. Remove with a slotted spoon and drain on paper towel, then repeat with remaining two eggs. Grill or toast muffins and top with watercress and smoked trout. Trim eggs neatly and put on top. Spoon over hollandaise, season well and serve with caperberries.